Hi and welcome to the last day of July! Can you believe it? This month has flown by and in two short weeks, my son starts kindergarten. Wow! He is so ready and I am getting there. Today’s photo challenge is Workspace. I first included the desk and computer where I write and brainstorm my story ideas. In addition, I help with my husband’s and father’s business. They provide educational consulting and I have been helping with the office work. It is a great arrangement since I can be at home or at my in-law’s home and still be with our son. And, there is a pretty view of trees and grass out the window. 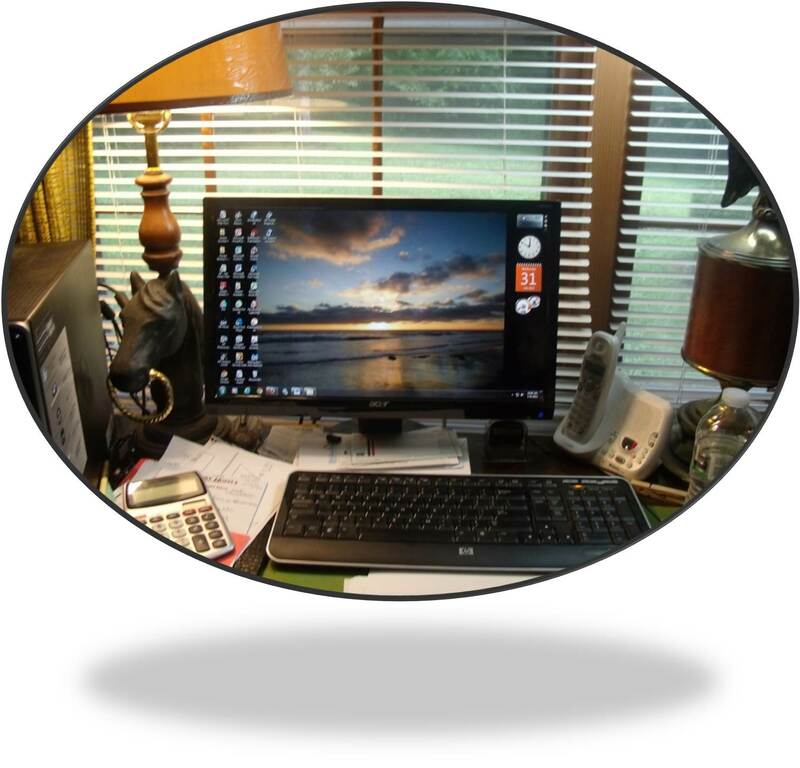 I have many other work spaces since I am a stay-at-home mom. This second picture is of Ian helping me make dinner. That is one of our most important work spaces. He loves to help make our meals and be part of the family team. 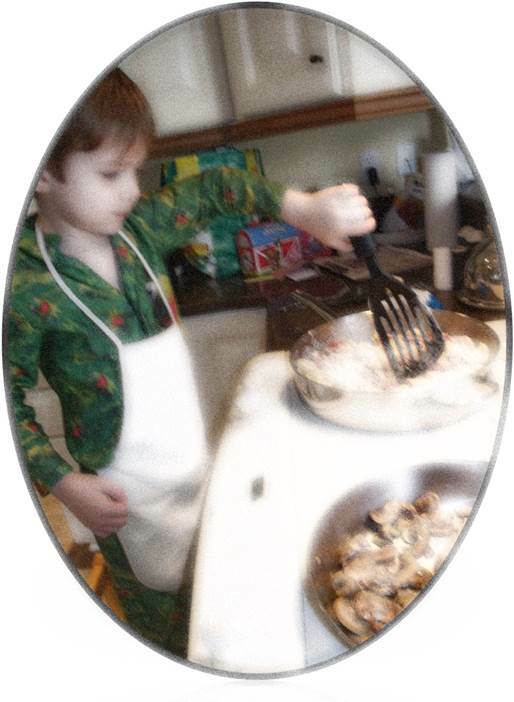 We have talked about the fact that food tastes better when you help to cook it. It’s cool that he gets that concept. We could also include the laundry room, his toy room, our favorite reading spot, the table where we color and play games, and yard where he likes to play and help with the yard work. What is your work space? An office, a store, a school, or outside? There are so many places to work. I wonder if I will appreciate my many work spaces. I will certainly try. 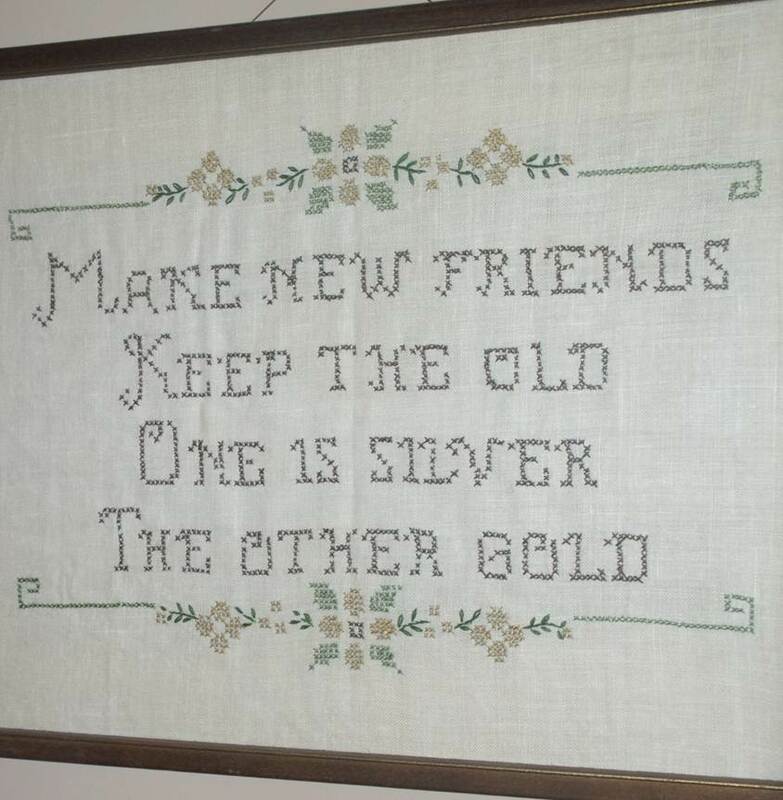 “Make new friends but keep the old, one is silver and the other gold.” –– I have posted this quote twice this week. I wanted to include it today since it’s about friendship. “Friends are friends forever, if the Lord’s the Lord of them. And a friend will not say never cause the welcome will not end…” — words from a great song. Today’s photo challenge is Friendship. There are so many types of friends and friendship. How do you capture this in a photo? I decided to post a photo I took in 2006 at the beach of my niece and nephew. 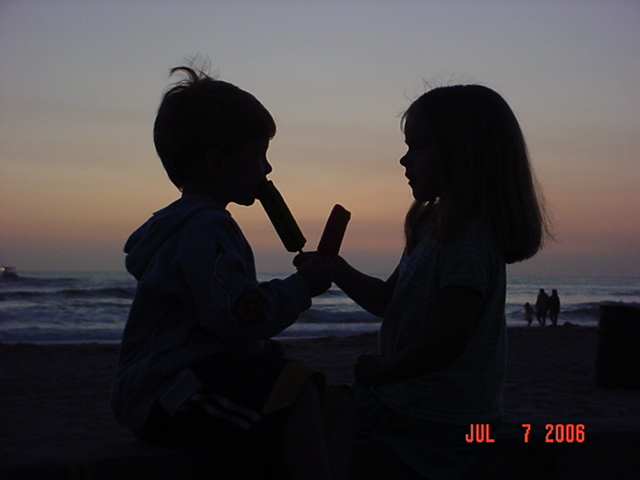 They were sharing popsicles at sunset. This is one of my favorite pictures I took that summer. I think this shows the element of sharing and fun that friends have with each other. I have friends from elementary school days, high school, as well as college, and I have newer friends who I worked with, who also write, and moms of Ian’s preschool buddies. There is a saying that you can’t choose your family but can choose your friends. I have been blessed to have a wonderful family and fabulous friends. I wonder if we can be the kind of friend that we’d like to have. Here’s hoping we can!! Another Monday and it finally isn’t going to be raining! I am so thrilled about that! Just three days left of July’s Photo-A-Day Challenge. I haven’t done a photo each day but most of them. It has been so much fun. Today’s challenge is Perspective. I took three photos for today. What do you think? 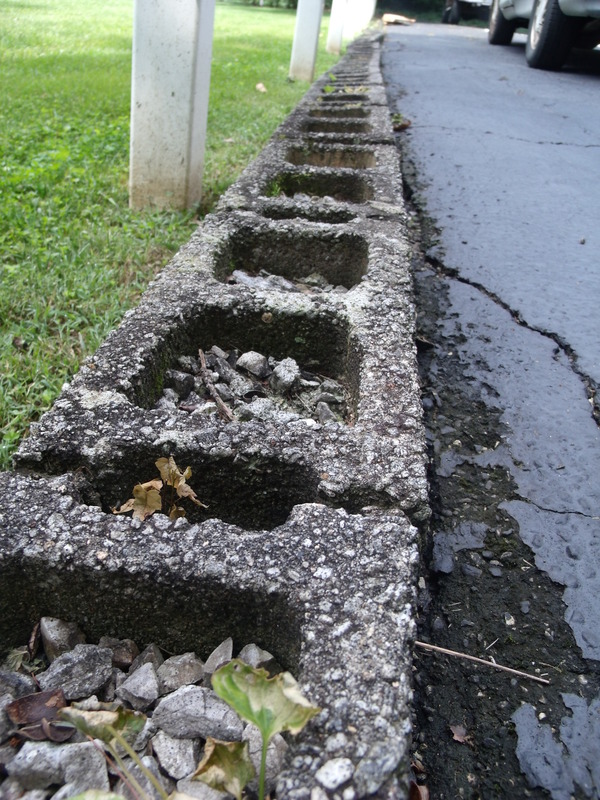 The first is looking up at a beautiful and very tall tree, the second is a line of blocks along a driveway, and the third is a drain along that same driveway. It is actually empty in the picture. I loved all of the detail of this amazing and very tall tree. 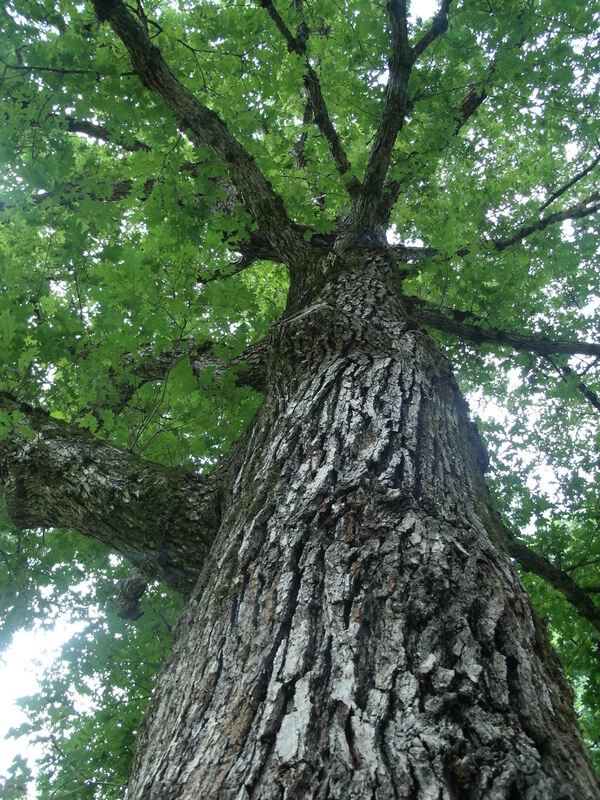 I want to reach out and touch this bark and sit under the canopy of leaves. The blocks are also interesting and starting to show their wear and tear. 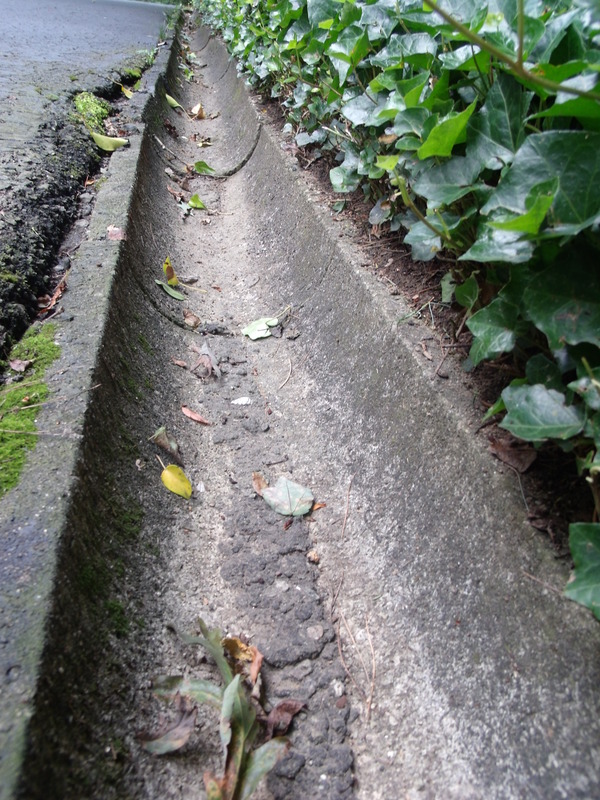 For the drain, this reminds me of the side of a bowling alley. I wonder what other perspectives we can find today that are different and unusual? It should be fun to find out!! Have a great start to your week. July 28 – This Is New! I am very late in my posting today. After a super busy week, we’ve had a lazy day. Playtime, resting, reading, and coloring have been on our agenda today. Our agenda has been fabulous!!! I decided to post a favorite needlepoint. It is about friendship. Those who have been in Girl Scouts or Camp Fire know these words as a song. Many of my new things — clothes, books, and other items that we buy are either purchased at a consignment shop, a yard sale, or marked down and on sale. I have kidded that I am genetically cheap, And, I must say am proud of that! I like the items that can be found at these stores. And, being a stay-at-home mother, I try to find bargains when and where I can. Most of the new things we buy are food and I do splurge on Trader Joe’s (which is Ian’s favorite store). I decided not to take pictures of those. What is new to you? Hi and Happy Saturday! Today’s photo challenge is Black and White. I can think of many things to write about but taking photos is more challenging for me. I did take three pictures for this challenge. Please let me know what you think. Remember the Michael Jackson song, Black or White? I thought of this one today. And, “What is black and white and read all over? A newspaper.” I still love to read an actual newspaper but now a lot of them have color in the ads and photos. 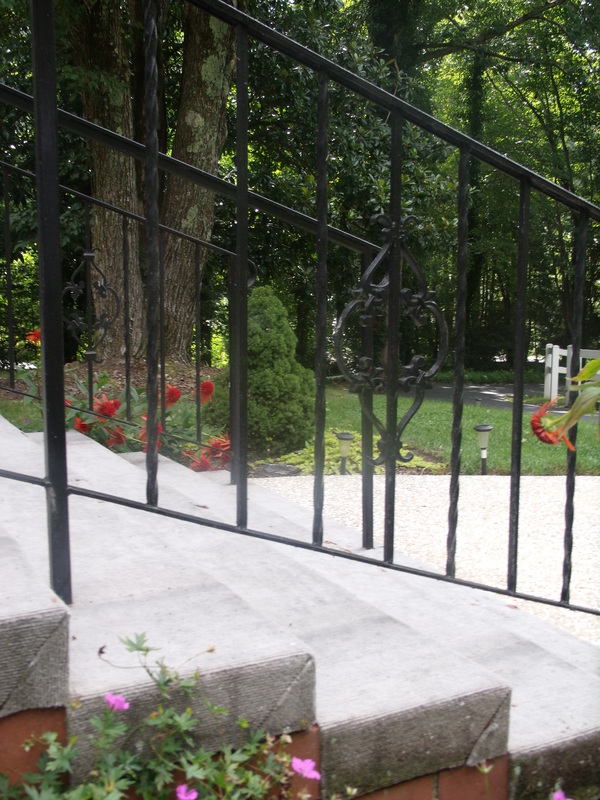 This first picture is of the black handrails and white steps outside my in-law’s house. There are other colors in the background, but I thought it was a cool angle. 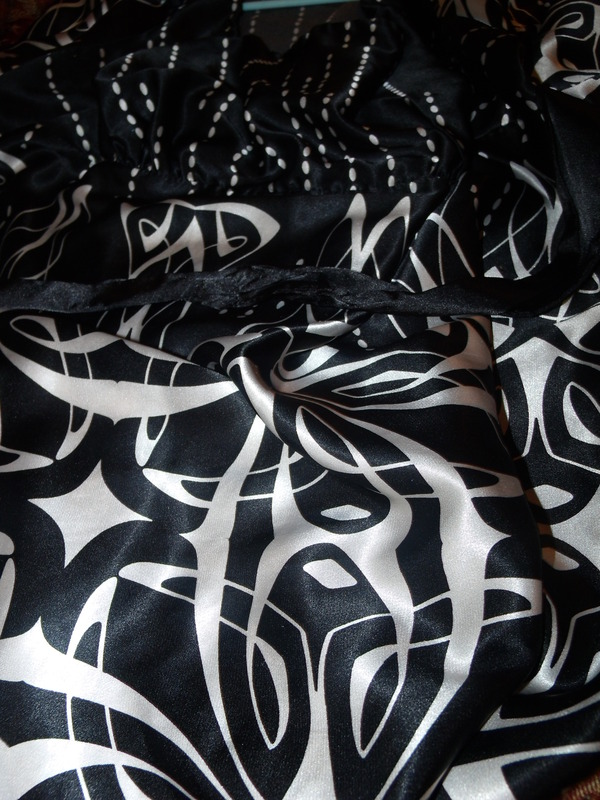 The second one is a close up of one of my blouses. It has a nice design. This blouse I bought at a second-hand store. 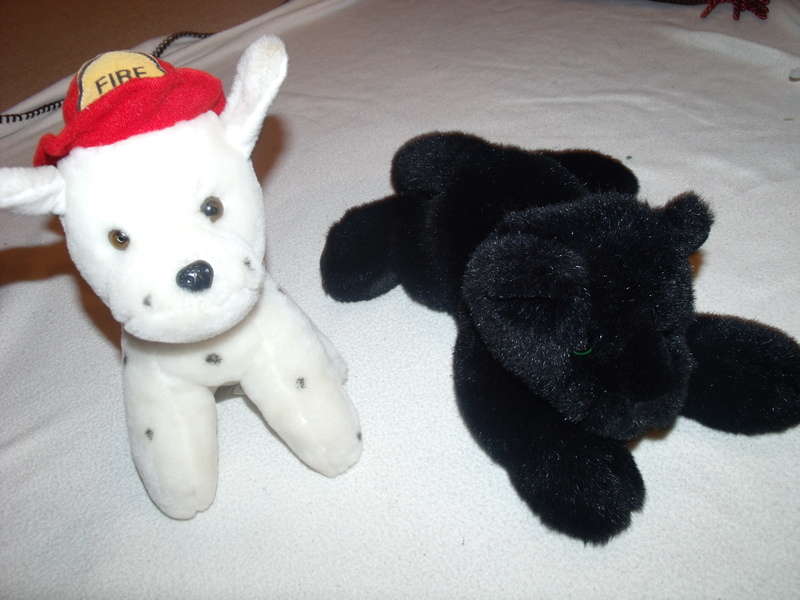 The third one is two stuffed animals that Ian was playing with — a fire dog and a cat. He has been saying they are family. I wonder what other black and white items I will see? I again am taking a day off from the Photo-A-Day challenge to write my Five Minute Friday posting. I will be back to the photos tomorrow. Today’s word for Five Minute Friday is Broken. The first thing that comes to mind with this word for me is something the pastor says in Holy Communion. “This is my body, broken for you. Take and eat.” Wow, what a gift to receive the Lord’s body and blood. Communion was always a special time at church for me growing up. We’d have it twice a month so it felt like a special occasion. My church uses wine and wafers. Also, I think of the time that I fell and broke my arm. Thankfully it was only a hairline fracture. I didn’t even need a cast for it. That was cool. Another time I was run over with a friend of mine. We were in a parking lot after church. Three of us were talking when a car went out of control. Two of us ended up under the car and the other friend was bumped and flew through the air. Amazingly none of us ended up with broken bones, just scrapes and bruises. Isn’t that amazing? Our guardian angels were working overtime that day. The only person who did break something was a man watching the entire accident — he fell and broke his hip. Isn’t life odd? Sometimes you are hurt but not broken. Other times you feel broken and need time to put the pieces back together again. Thankfully there is prayer, our faith, and our friends and family to help us through these awful times. I wonder if we can find the support and comfort that we need when we are broken. I hope and pray that we can. Hello and Happy Thursday! Today is my father-in-law’s birthday! Happy Birthday to him. We’ll have cake with him and are taking him out for dinner tonight. Should be a day of fun! Today’s Photo-A-Day Challenge is Ground and it’s Throwback Thursday. So, I decided to go with an old picture of Ian at the beach. This is at a beach in Fort Pierce, Florida. There are shells all over the sand, which I love! I walked a few miles on this beach collecting shells. Now I have a vase full of them. In this picture, Ian was about 2 years old. He still had his pacifier in his mouth. At that time of his life, it was hard to find him without it. I love the look on his face in this picture. He is so happy and full of adventure. See his dimple? He has them on both cheeks. 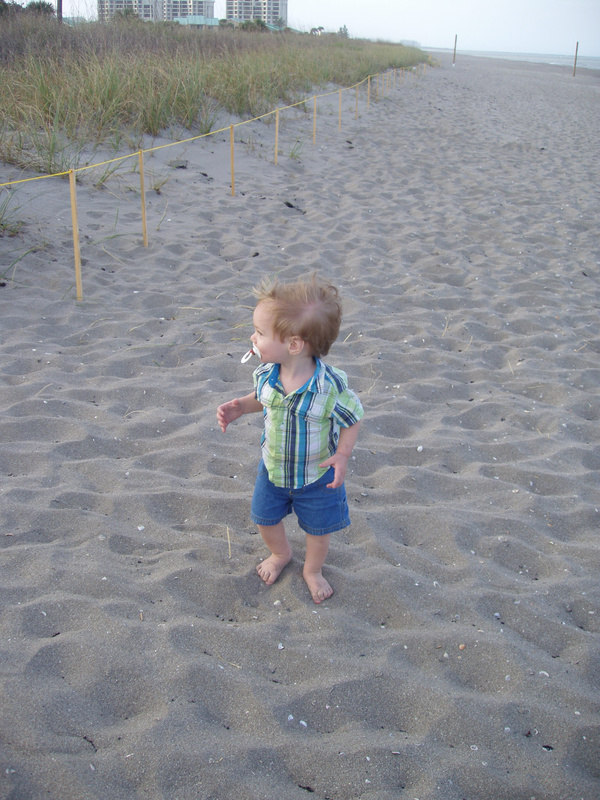 He loved being barefoot that day so he could enjoy the sand. He was fascinated with the texture. This was a day that he ran around and had a ball. He has grown quite a bit since then and no longer has the paci, but he still loves the beach!!! Just like his mommy. This sand is very different from my favorite Mission Beach, CA. I love that each beach has its own uniqueness. Special times have been had at both of these beaches!! Hope you have a great Thursday! I wonder what adventures today will hold? I don’t know about you, but I can’t wait to find out! Well, just one more week left of July. Where has the month gone? It sure has flown by!! This will be the first month since I started my blog that I have posted something each day. It has been fun and has kept me on my toes. It has been very nice to write a little bit each day and also practice using my new camera. I am not sure how long I can keep this up but I have enjoyed it! To you my readers, do you like reading something new each day? Do you like looking at new pictures each day? I may continue the photo-a-day into August and see how it goes. 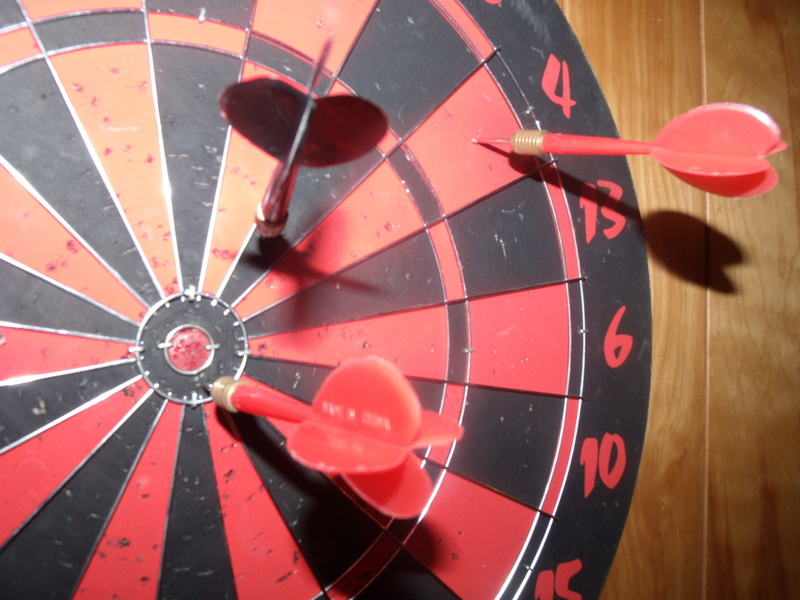 Today’s Photo-A-Day is D is For… I chose darts. I thought these made for a cool picture. What do you think? These are on the wall at my in-law’s house. They are now more for decoration than anything. You can see from all the holes on the dartboard that they weren’t just for decoration. This board has seen some throws. There were many things that I could have chosen from for today but this one just looked like a fun picture to me. July 23 – I Drew This! Today I have Tuesday Tunes and another photo for the July Photo-A-Day Challenge. For July 23, the challenge is I Drew This! 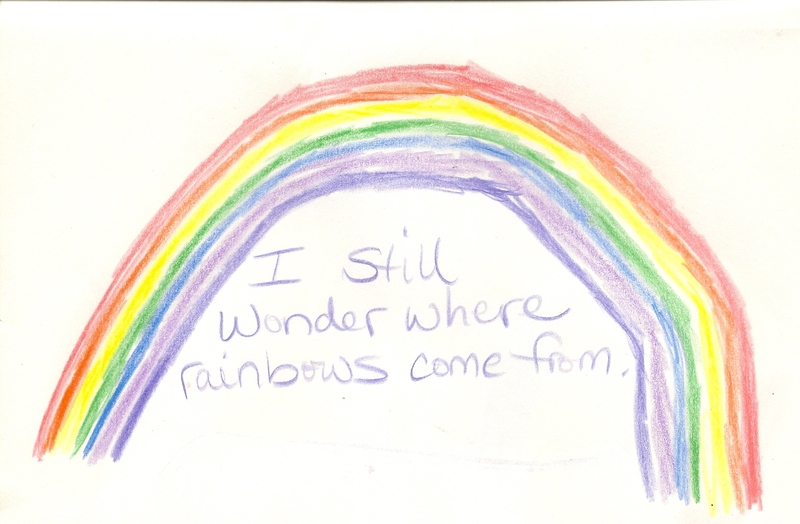 As my regular readers know, the phrase “I Still Wonder Where Rainbows Come From” inspired the name of my blog and my writings. My grandfather was a storyteller. The quote is something often said by one of grandpa’s characters. This character was always looking for where rainbows come from. He would regularly get into trouble during his quest and then need his friends to help bail him out. Hearing my grandpa weave his tales was fun and an amazing gift. I thought everyone knew about this layered character. Later in my life, I found out these were special for my family and our friends. At the end of each story, this character would scratch his head and say, “I still wonder where rainbows come from.” This drawing celebrates that. I have closed quite a few of my blogs with “I still wonder.” I mention that about the topic I am writing on. I want to keep this mindset of wondering and learning in my life and my son’s life as well. I have always liked these stories and wondering about many, many things. I also know and love that friends and family will help me through the tough times. This was a great message that my grandpa illustrated in vivid and active stories. And, I have always loved rainbows! I remember learning the colors in school – ROYGBIV — Red, Orange, Yellow, Green, Blue, Indigo, Violet. These are all here — although the orange is tough to see. I wonder what new item will inspire me next. I so look forward to finding out! May you find and enjoy your quest! To read more about the phrase, please see https://patticates247.wordpress.com/welcome-to-my-blog/. For Tuesday’s Tunes, I wanted to mention the latest in music that Ian has been singing. This morning he said, “I love Bon Jovi.” And, he has been singing a few of the songs! We have a greatest hits CD which includes the great song, It’s My Life. It includes several parts where Richie uses a special microphone to make modulated sounds. Ian likes the wah-wahs that he does. And, he loves to sing the words as well. I love it since they have been one of my favorite bands for years. I saw them in concert in 1988 and would love to again. Yesterday, he pretended two of his Hot Wheels firetrucks were members of the band. One was Jon Bon Jovi and the other was Richie Sambora. And, his other cars said they enjoyed the concert. Our family has a new generation which loves this group! Isn’t that great? Another Monday and it’s supposed to rain today. Thankfully I have plenty to do inside. Today’s Photo-A-Day Challenge is Grey (or Gray as I normally spell it). I took a photo of some items that are grey. They are all items that I have recently been using. The current book that I am reading has a grey cover. It is “Promises to Keep” by Jane Green. It is a great book about friends and family and how they pull together during a crisis. 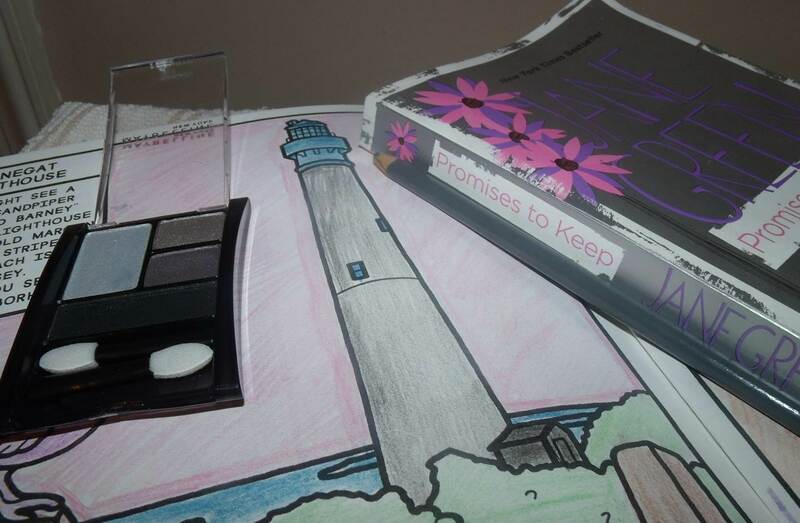 The other grey is my pencil next to the book which I used in this lighthouse picture. I like to color sometimes. It is very calming! If you haven’t tried it, you ought to! And, the other grey is my eye shadow. These colors work to compliment my brown eyes. Here’s hoping today isn’t grey from the rain!! If it is, it might make for some great photos!